Academic medical centers (AMCs) are no strangers to operating in a challenging environment; however, the challenges have never been more significant and the future more uncertain than now largely due to the changes affected by the health care reform and the possibility of more changes stemming from the political arena. The looming threat to the triple mission of outstanding clinical care, education, and research can only be successfully thwarted by a shift in the mindset of health-care leadership to better align with winning strategies for a volatile environment. Adapting some of the proven leadership strategies in a business setting may be beneficial in navigating the challenging and changing healthcare arena. Two strategies are highlighted with examples in this review: the adaptation of a “growth” mindset over a “fixed” mindset, and application of compassionate management during challenging times, both of which have been shown to improve the overall financial performance of a company. 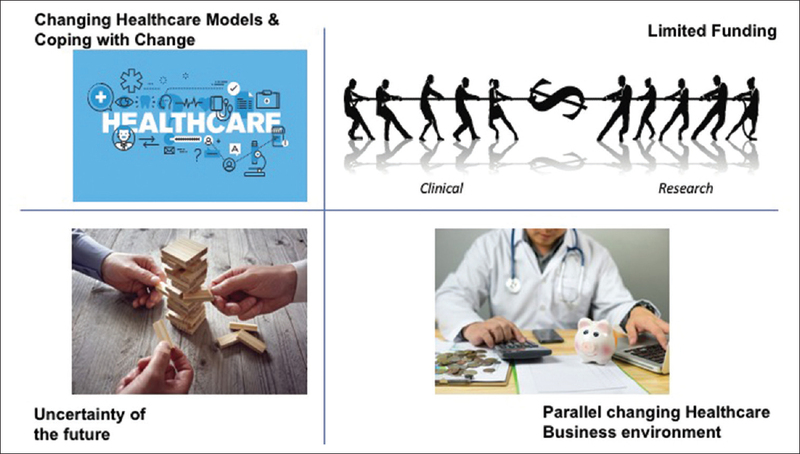 Integration of these strategies and allocation of resources to professional growth and leadership development can equip health system managers, physicians, staff and trainees with the adaptive tools necessary for meeting the increasing demands and ensuring the continued success of an AMC. With nearly 6000 pathologists and 2200 residents working in an academic setting, an increasing emphasis on leadership development and management tools for pathology professionals is timely. The following core competencies are addressed in this article: Interpersonal and communication skills, Practice-based learning and improvement, Professionalism, Systems-based practice. Maggot debridement therapy (MDT) has a long and well-documented history. Once a popular wound care treatment, especially prior to the discovery of antibiotics, modern dressings or debridement techniques, MDT fell out of favor after the 1940s. With the increasing prevalence of chronic medical conditions and associated complex and difficult-to-treat wounds, new approaches have become necessary to address emerging issues such as antibiotic resistance, bacterial biofilm persistence and the high cost of advanced wound therapies. The constant search for a dressing and/or medical device that will control pain, remove bacteria/biofilm, and selectively debride necrotic wound material, all while promoting the growth of healthy new tissue, remains elusive. On review of the current literature, MDT comes very close to addressing all of the previously mentioned factors, while at the same time remaining cost-effective. Complications of MDT are rare and side effects are minimal. 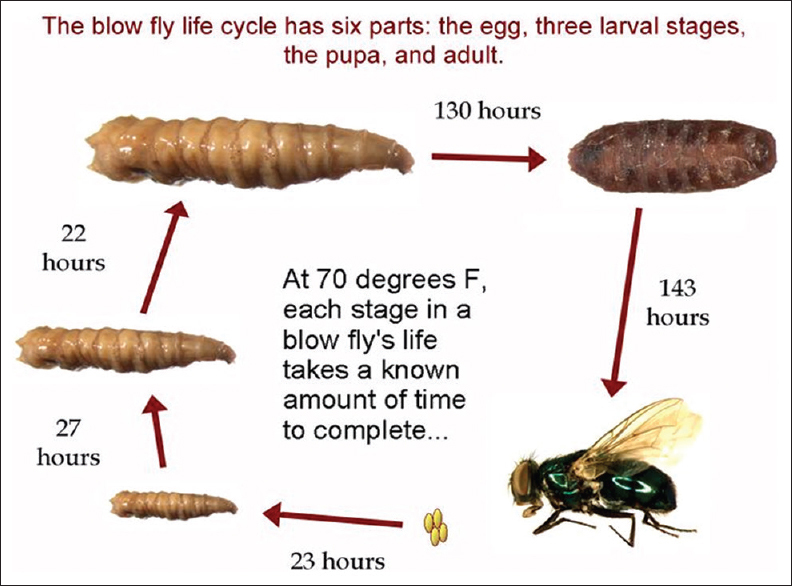 If patients and providers can look past the obvious anxiety associated with the management and presence of larvae, they will quickly see the benefits of this underutilized modality for healing multiple types of wounds. The following core competencies are addressed in this article: Medical knowledge, Patient care, Practice-based learning and improvement. Background: Burnout is hallmarked by physical and psychological exhaustion, coupled with cynicism and disengagement. Evidence suggests that affected physicians not only suffer personally, but that patient safety and clinical outcomes are also negatively affected. This study aimed to identify potentially remediable risks for burnout among residents enrolled in Canadian general surgery programs. 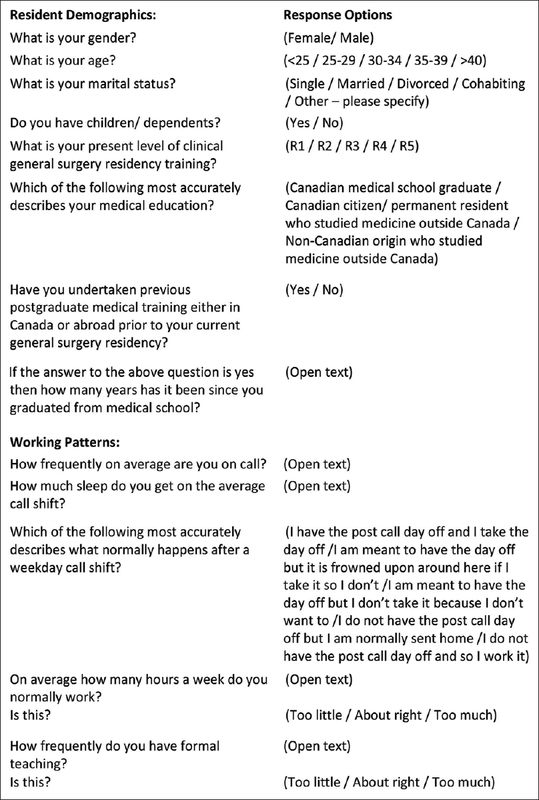 Methods: In this cross-sectional design, a questionnaire was distributed to every general surgery resident in the 15 programs consenting to participate. Questions examined the following five domains: demographics, working patterns, attitudes toward residency, life experiences, and lifestyle/outlook. Respondents' risks of burnout were assessed using the Maslach Burnout Inventory™. Univariate analysis and then multiple logistic regression were used to assess predictors. Results: A total of 114 completed questionnaires were received (22%). Of these residents, 39 (34%) met the criteria for high burnout risk. Inadequate personal/family time, a personal history of mental health or substance abuse-related issues, and moderately to poorly approachable staff/senior residents were all significantly associated with a high burnout risk (odds ratio [OR] =4.3, 95% confidence interval [CI] =1.6, 11.2, P = 0.003; OR =6.0, 95% CI = 1.6, 21.9, P = 0.007; and OR = 4.6, 95% CI = 1.7, 12.5, P = 0.003 respectively). Predicted high burnout risk probability with none of the above factors was 10%, increasing up to 40%, 75%, and 93% with one, two, or all of these risk factors present respectively. Conclusion: One-third of general surgery residents in Canada are at high burnout risk. Residency programs may have considerable influence over factors associated with this outcome to the benefit of residents, staff, and patients. The following core competencies are addressed in this article: Practice-based learning and improvement, Professionalism, Systems-based practice. Objectives: Achieving procedural competency during diagnostic radiology residency can impact the radiologist's future independent practice after graduation, especially in a private practice setting. However, standardized procedure competency training within most radiology residency programs is lacking, and overall procedural skills are still mainly acquired by the traditional “see one, do one, teach one” methodology. We report the development of a simple standardized procedural training protocol that can easily be adopted by residency programs currently lacking any form of structured procedural training. Materials and Methods: An ad hoc resident procedural competency committee was created in our radiology residency program. A procedural certification protocol was developed by the committee which was composed of attending radiologists from the involved divisions and two chief residents. A road map to achieve procedural competency certification status was finalized. 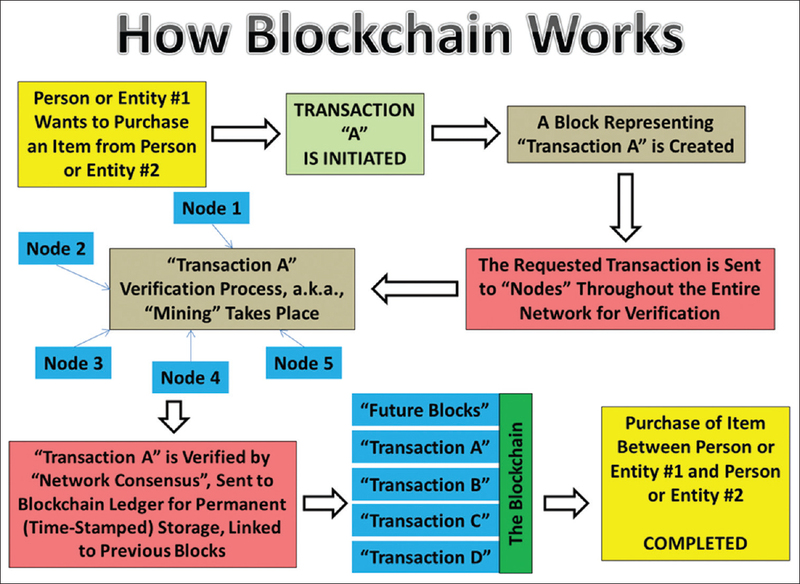 The protocol was then implemented through online commercial software. Results: Our procedural certification protocol took effect in September 2014. We reviewed all resident records from September 2014 to December 2016. Eighteen residents of various levels of training participated in our training protocol. About 72% became certified in paracentesis, 11% in thoracentesis, 83% in feeding tube placement, 55% in lumbar puncture/myelogram, and 77% in tunneled catheter removal. Conclusions: Our single-center experience demonstrates that a simple to adopt structured approach to procedural competency training is feasible and effective. Our “certified” radiology residents were deemed capable of performing those procedures under indirect supervision. The following core competencies are addressed in this article: Patient care, Medical knowledge, and Systems-based practice. Background: Understanding the preoperative fears and anxieties in patients who are planned for surgical procedure is of paramount importance. Objective: To know the preoperative levels of anxiety in patients who received versus who did not receive The World Health Organization (WHO) tool before undergoing elective surgical intervention. Materials and Methods: The present study was conducted in the departments of surgical disciplines of Narayana Medical College and Hospital, Nellore. For the project, a total of 100 (50 in each group) adult patients (>18 years and <60 years) who were planned for elective surgical intervention were included in the study. Informed consent was obtained from the patients. The WHO's “Patient Communication Tool: What you need to know before and after surgery” which helps the surgical patients to ask the questions related to their surgery and related events was used to provide information. “The Amsterdam Preoperative Anxiety and Information Scale” which is a 6-item questionnaire with the scores ranging from 4 (not anxious) to 20 (highly anxious) was used to measure the preoperative anxiety. The patients were divided in two groups: Group A (those who did not receive the questionnaire) and Group B (those who received the questionnaire). SPSS (version 24.0 for Macintosh) was used for data analysis. Results: Median age of all the participants was 49 years. Age, gender, and education status, both the groups were not statistically significant. Based on the analysis, it was found that in Group A, patients had slighter higher response score than that of Group B. However, mean difference between both the groups was not found to be statistically significant. Mean response score of individual question, between both the groups, were significantly different in half questions, while not significant in remaining half of the questions. Among six questions, statistically significant (P = 0.017) difference was found in anesthesia-related responses. While for procedure-related responses, difference in mean responses was not statistically significant (P = 0.331). Conclusion: Effective physician–patient communication is the key in establishing trust, resulting in delivering a satisfactory care to the patient. There is a need to carry out further studies with an inclusion of a larger number of participants with a more precise tool to impart the knowledge about the surgical intervention and to ameliorate the peri-operative anxiety in patients who are undergoing surgical intervention. The following core competencies are addressed in this article: Patient care, Communication skills, Practice based learning and improvement. Descriptive statistics are used to summarize data in an organized manner by describing the relationship between variables in a sample or population. Calculating descriptive statistics represents a vital first step when conducting research and should always occur before making inferential statistical comparisons. 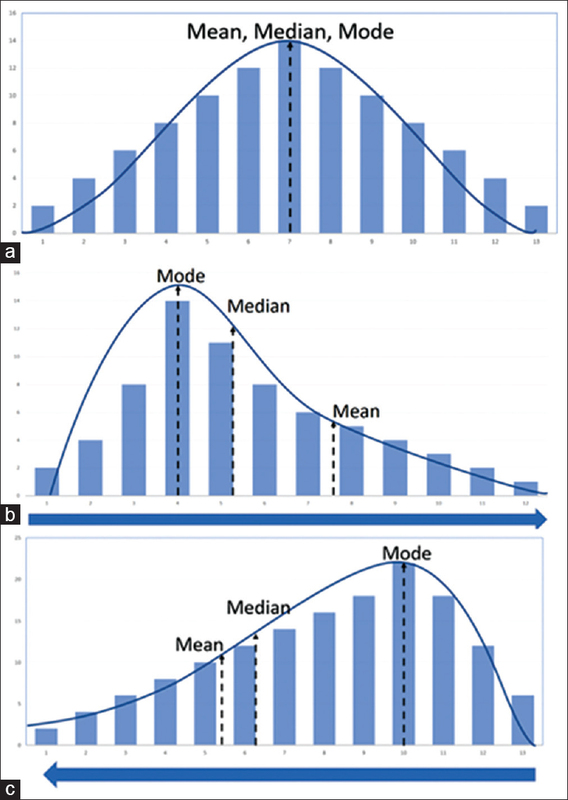 Descriptive statistics include types of variables (nominal, ordinal, interval, and ratio) as well as measures of frequency, central tendency, dispersion/variation, and position. Since descriptive statistics condense data into a simpler summary, they enable health-care decision-makers to assess specific populations in a more manageable form. 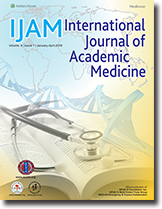 The following core competencies are addressed in this article: Practice-based learning and improvement, Medical knowledge. Pulmonary cement embolization (PCE) is a rare but significant complication of vertebroplasty surgery. The management of this process is not well studied and depends on the extent and duration of symptoms. 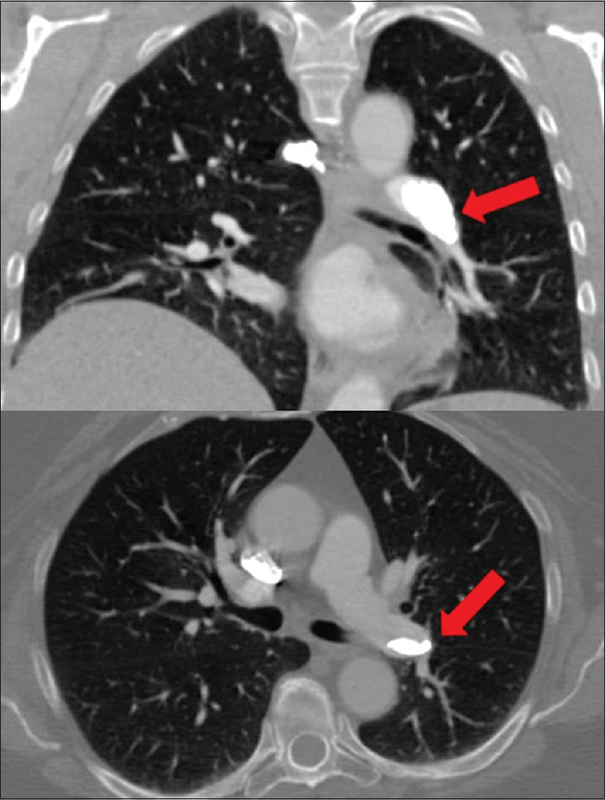 Here, a case of 68-year-old woman is presented who was found to have a symptomatic PCE involving the left main pulmonary artery 9 months after a kyphoplasty surgery was performed with polymethylmethacrylate. She was successfully managed surgically by the left main pulmonary embolectomy with complete symptomatic resolution postoperatively. The following core competencies are addressed in this article: Patient care, Medical knowledge. Anti-N-methyl-D-aspartate receptor (anti-NMDAR) encephalitis is an autoimmune encephalitis associated with ovarian tumors, rarely seen in emergency departments (EDs). There are proposed diagnostic methods and recommended treatment guidelines for anti-NMDAR, however, as this is a rare form of encephalitis, diagnostic, and treatment recommendations continue to be explored. We describe the case of a 26-year-old female patient who presented to our ED with altered mental status, exhibiting orofacial dyskinesias and choreathetoid movements. The patient was subsequently found to have an ovarian tumor and diagnosed with presumed anti-NMDAR encephalitis. The following core competencies are addressed in this article: Medical knowledge, Patient care. Background: Histoplasmosis is a progressive disease caused by dimorphic intracellular fungi. When infection is present, it is usually in immunocompromised individuals. We report an unusual presentation of progressive disseminated histoplasmosis in patient with raised Ig levels as but low CD4 and CD8 levels, in a rare case of severe combined immunodefiency. Case Report: A 7-year-old female with history of intermittent fever for 8 months, multiple joint pain and weight loss for 2 months. On examination, she had pallor, erythematous plaque on face and hepatosplenomegaly. The patient had high levels of immunoglobulins and reduced CD4, CD8 count. 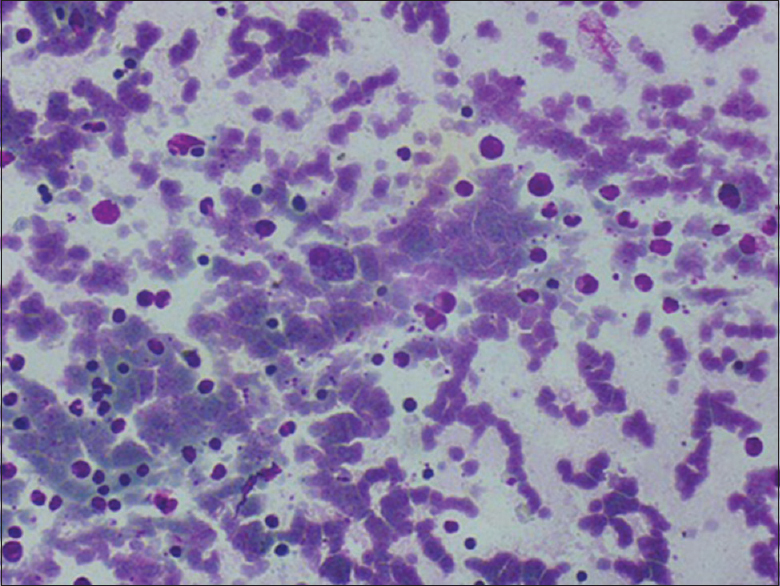 Disseminated histoplasmosis (DH) was diagnosed on microscopic examination of bone marrow and skin biopsy and was confirmed by fungal culture of bone marrow & blood. Discussion: SCID is characterized by abnormalities in T-cell, B-cell, and NK-cell functions. In our case, CD-4, CD-8 count was reduced but B-cell defect was not present, leading to the wrong perception of immune status of patient. Our patient might be suffering from the type of SCID which has T-cell defect without the loss of B-cell function. Conclusion: Our case represents a unique paradox in which the impaired cellular immunity resulted in immune deficient status causing disseminated histoplasmosis in an individual with intact humoral immunity, posing a diagnostic challenge. The following core competencies are addressed in this article: Medical Knowledge, Patient care. 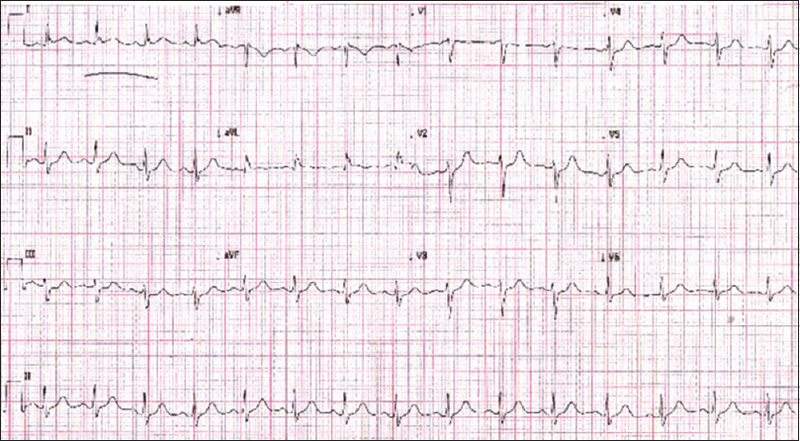 A healthy, 56-year-old female with a history of panic disorder presented to the emergency department (ED) with chest pressure. Physical examination and supporting data were within normal limits. Despite normal stress testing, she experienced recurrence of the chest pain the same day, and repeat ED assessment revealed isolated ST elevation and a troponin of 0.15. Following admission, serial troponin increased to 26.35 and subsequent coronary angiography revealed normal coronary arteries and a ventricular wall motion consistent with reverse takotsubo cardiomyopathy. The patient unexpectedly succumbed to a malignant arrhythmia on day 3. The following core competencies were addressed in this case report: Patient care, Medical knowledge, Patient education. Embryonal rhabdomyosarcoma has the second highest frequency in the head and neck region. A rare case of embryonal rhabdomyosarcoma in a 9-year-old male child involving nasopharynx with hydrocephalus is reported. The child presented with difficulty in breathing and swallowing with bleeding from nose and mouth. Local examination revealed a granular mass in the left nasal cavity. There was associated proptosis of the left eye. On probing, the mass was friable, nontender and did not bleed on touch. Posterior limit of the mass could not be assessed. Examination of throat showed smooth downward bulge of soft palate on the left side extending into the lateral wall of pharynx behind the posterior pillar of left tonsil. Examination under general anesthesia confirmed the presence and attachment of granular mass to the posterosuperior wall of the nasopharynx and filling the left choana as well. Fibrosarcoma, mucormycosis, nasal polyposis, juvenile nasal angiofibroma, and rhabdomyosarcoma of the nasopharynx were considered in the differential diagnosis. Nasal polyposis was excluded from the differentials after gating computed tomography (CT) scan report was obtained. Histopathology of the excised mass proved the diagnosis of rhabdomyosarcoma and CT scan of the brain showed communicating hydrocephalus. Treatment plan included multi-drug chemotherapy and debulking surgery. The following core competencies are addressed in this article: Medical knowledge, Patient care. Demographics are an important tool for narrowing down the differential diagnosis for many medical presentations, and though usually steadfast, there are exceptions in using demographics as a guideline for diagnosis. Neoplastic bony lesions are particularly reliable in their presentation within a specific age range. However, if these cases are not fully evaluated and demarcated from one another, it may lead to overevaluation and treatment or underevaluation and treatment of benign neoplastic bony lesions. In this report, we present the case of a 30-year-old male with an osteoid osteoma presenting out of the typical age range. We also include the subsequent treatment of the benign tumor with radiofrequency ablation after the initial failure in medical management. 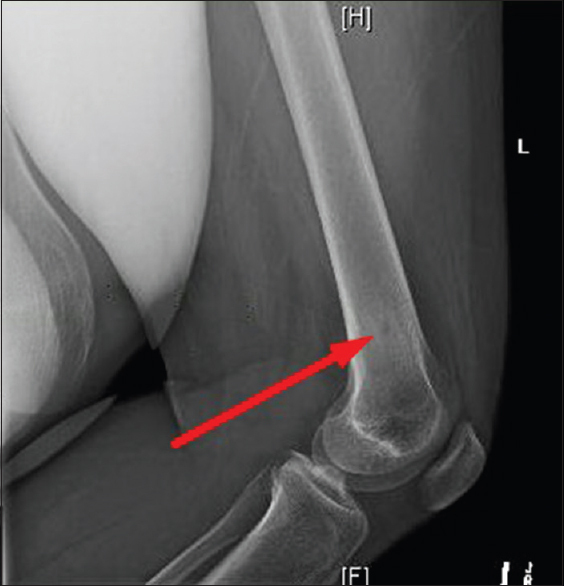 The age range of the presentation of osteoid osteomas is commonly reported in the literature as 5–25 years, and the treatment can be medical or surgical. Here, we discuss the treatment options, demographic presentation, and course of osteoid osteomas. The following core competencies are addressed in this article: Patient care, Medical knowledge.